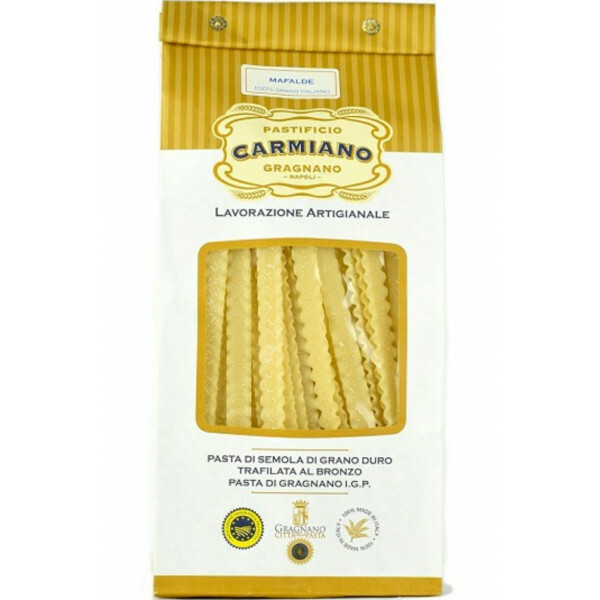 Mafalde IGP pasta is long wide strips of pasta with wavy edges on both side. This Type of Pasta is prepared in a similar fashion to other pasta as linguine or fettuccine. Perfect with ragu, with mushrooms sauce or with chopped vegetables. The Carmiano Pasta Factory has obtained the P.G.I. This certification is a trademark of quality attributed in Italy to food and agricultural products. If a product is worth the PGI certification, it means that its quality and uniqueness depend on its geographical origin and testifies the tradition of Carmiano Pasta. For 100 g of pasta is needed 1 lt of boiling water. You are advised to add 10g per litre of cooking sale. Stirring occasionally gently. Taste to verify the perfect level of cooking. Drain pasta, add the dressing and serve.